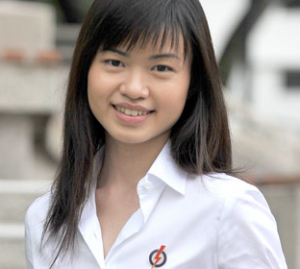 SINGAPORE - Ms Tin Pei Ling's first foray into the public eye as People's Action Party's youngest candidate has seen her at the receiving end of netizens' criticisms. Shortly after her introduction to the media, bloggers and websites have picked her apart, with the most harsh comments reserved for her young age, and allegations that she was fielded because of her husband's position as principal private secretary to Prime Minister Lee Hsien Loong. Ms Tin, 27, is a senior associate at Ernst & Young Advisory. She has been serving in the grassroots for seven years and is expected to contest in the MacPherson ward in the Marine Parade group representation constituency (GRC) in the coming General Election. Pictures from her Facebook account have also emerged, and show her posing with a Kate Spade shopping bag or on holiday with her husband.